Connected to drive shafts, disk couplings are used to accommodate misalignment between the motor & driven machinery and reduce bearing loads. An analysis was undertaken for Bibby Transmissions to evaluate the angular stiffness of current designs and compare results with experimental tests. A typical coupling consists a pack of thin steel disks that are attached to the drives via alternate bolts. Two designs were investigated: a single disk and a pack of 20 disks. 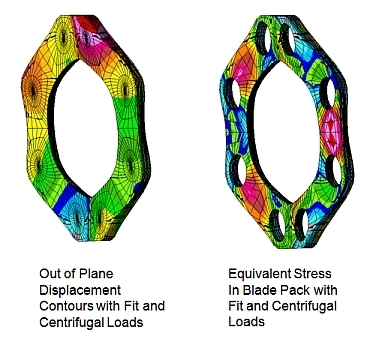 As multiple load cases were to be undertaken, the finite element model had to be accurate yet efficient to create and run. The model was constructed parametrically to enable geometry parameters (no. and diameter of holes) to be changed easily. The disks were modelled using shells with the connections represented by a spider network of stiff beam elements. The effects of disk growth, due to high speed angular rotation, and radial tension from connection to the shafts were included in combined load cases. Combinations of displacement, centrifugal and thermal (to simulate interference fit) boundary conditions were applied. Assessment of coupling performance was obtained from deformation and stress results and effective bending stiffnesses were derived.